Mailbox Monday, created by Marcia at To Be Continued, formerly The Printed Page, has a permanent home at its own blog. To check out what everyone has received over the last week, visit the blog and check out the links. Leave yours too. Also, each week, Leslie, Martha, and I will share the Books that Caught Our Eye from everyone’s weekly links. Home No Home by Naoko Fukimoto, which I purchased. 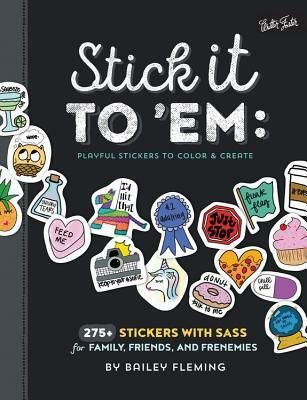 Stick it to ‘Em: Playful Stickers to Color & Create: 275+ stickers with sass for family, friends, and frenemies by Bailey Fleming for review. Stick it to ‘Em is your invitation to play as you create customized stickers with sass! With just a hint of silly irreverence, this guide includes a list of colorful art tools in addition to easy drawing and lettering techniques and step-by-step tutorials, all designed to get your cheeky creativity flowing. You’ll then be treated to more than 35 pages of stickers, including a selection of fully designed styles to use any way you like, a variety of stickers to color in, and blank stickers to create your own. Filled with tons of puns, wit, and wisecracks, Stick it to ‘Em is your answer to getting through each day with humor and fun. Mom & Me: An Art Journal to Share, Create and Connect, Side by Side by Lacy Mucklow for review. This full-color art journal for moms and kids to color and draw together in is designed to be a sharing experience. Mom and child can write each other letters, draw what scares them, imagine what they want to be when they are grown up, color a scene using only one favorite color, whatever their imaginations lead them to! Mom and Me: An Art Journal to Share is filled with fun hand-lettering and artwork from Bethany Robertson along with creative prompts from licensed art therapist Lacy Mucklow. Mucklow offers up the best ways to communicate with a child through creating together; how to start an open conversation with your child; questions you can ask that will help generate thoughtful responses; and how to tailor the quality time so it’s still fun and engaging for your child. This art journal has 50 full-color spreads to color, fill in, draw, and more. Each spread has a creative prompt or another exercise for mom and child to fill out together.